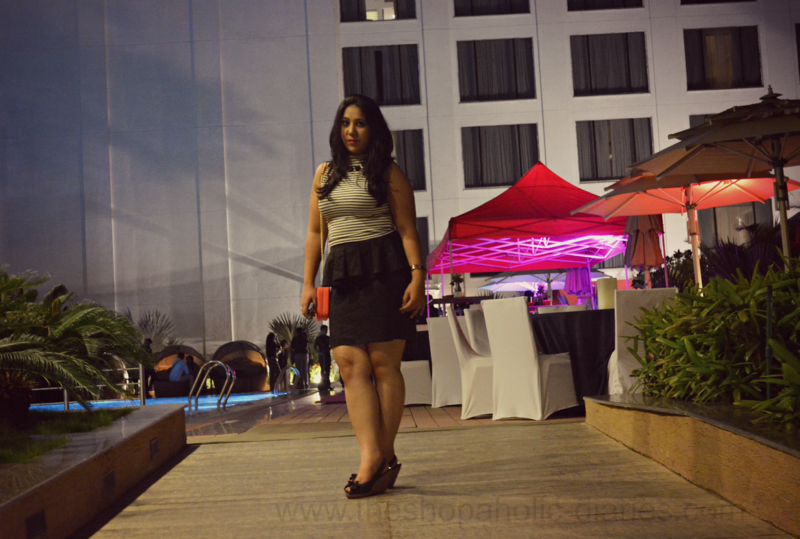 OOTD - Polka Meets Peplum - Curvy Style Guide | The Shopaholic Diaries - Indian Fashion, Shopping and Lifestyle Blog ! Here's a new outfit post to delight all my curvy readers who have sent me queries requesting more styling options for curvy body type. I have always been a fan of peplum style and while I own many tops and few dresses with a peplum style, I lacked a peplum skirt until I saw this beautiful skirt at a Forever 21 store in Delhi. In a classic style, this jacquard skirt features polka dots all over and a flattering peplum style. Last month I had visited Bangalore to attend a trade show organized by Madura Garments for its brands - Van Heusen, Louis Philippe and Allen Solly. The trade show was a unique showcase of their SS15 collection for the prospective buyers from all over India and I was also invited over to go through the collection and share our feedback. Later in the day, all the bloggers and media persons met over a cozy dinner at the poolside of Marriot hotel. I had a great time at the event, catching up with some amazing bloggers from all over India and making new connections. As it was a semi-formal dinner with the brand representatives of Madura Garments, I believed the Forever 21 skirt was a perfect choice. I paired the skirt with a sleeveless striped crop top from Forever 21 which has a perfect length and fit. I completed the look with a black statement neckpiece from Forever 21, Tresmode wedges and a Fossil watch. To add some color to the monochrome outfit, I paired it with a bright tangerine clutch purse from Cupcakes and Closet. Do you like peplum trend too? Let me know your views about my outfit in the Comments below. Wow! Love the skirt and the first picture is awesome! Love the pop of red, very classy outfit! Would love to follow each other on instagram, let me know on my blog, I always follow back!